We worked with Anna Reynolds, the curator of the exhibition, helping to source suitable fabrics to display for the visitors to touch. Claire Thornton and Jenny Tiramani were recorded for the audio tablets the visitors could listen to while looking at the paintings. They both gave talks at the joint V&A/Royal Collection study day that took place on the 1st June 2013 at the V&A Museum. Claire Thornton worked a 1:1 sample of the embroidery motifs decorating the c.1610 waistcoat, on loan from the Fashion Museum, Bath. There was a video of Claire working the sample and talking about the skill involved for the visitors’ audio-visual tablets. 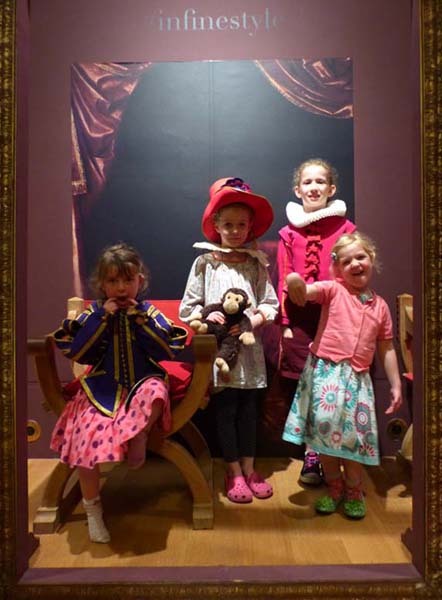 She also made garments for children to dress up in and have their photographs taken behind a full-length picture frame. Jenny Tiramani contributed commentaries to some of the portraits on the visitor tablets, including one on the perils of going out in the rain and of wearing clothing with metal thread fabrics and decorations in the Tudor and Stuart periods. The School ran a hands-on study day ‘Dressing in Fine Style: Ruffled, Laced and Slashed’ at the Queen’s Gallery on the 22nd June 2013. 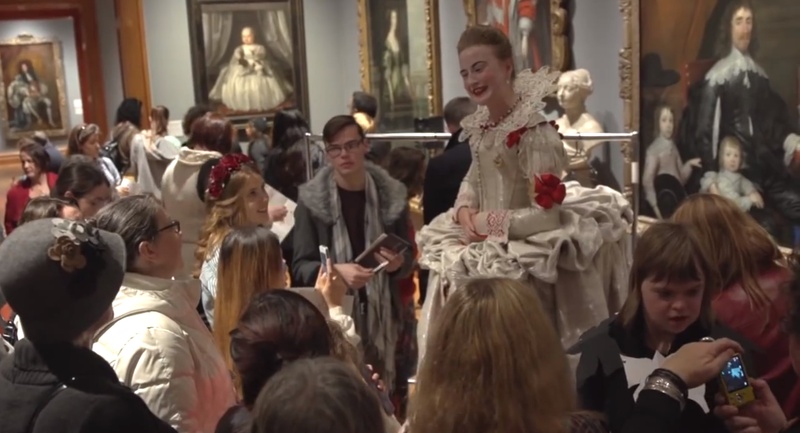 We held an evening of dressings and undressings of ELizabethan and Jacobean characters for a Late Shift at the NPG on Friday October 25th 2013. The event was free of charge and an estimated three thousand people visited the gallery during the course of the evening. Jenny Tiramani was Guest Curator for the evening and produced a free booklet with the gallery on the John Donne poem, ‘On His Mistress Going to Bed’. 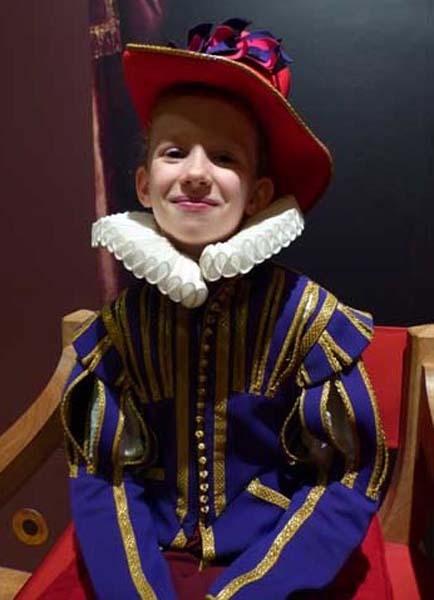 This poem was brought to life in the lecture theatre by actors Jonathan Oliver and Lizzie Philips, while members of the School talked to the visitors in the galleries about what it feels like to wear hand-made reconstructed dress of the period. Eve Goodman talking to visitors about wearing reconstructed Elizabethan clothing.